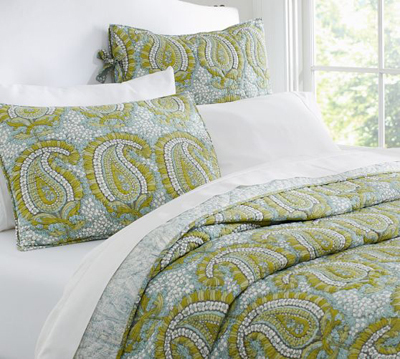 Heavily drawn leaves and flowers form a refreshing paisley in a traditional block-print pattern. This handmade Cecelia Paisley Whole Cloth Quilt reverses to a more modern paisley printed with a casual, windswept look and outlined in decorative stitching. $49.50-$209.00 Sale $29.50-$129.00. Free shipping. Buy here.